Padi E-Learning, start online today ! The Bida Islands, Hin Bida and Karen Heng are situated around 1,5 hours by big boat from Koh Lanta. These 4 dive locations give the best chances for sightings of Leopard Sharks and Blacktip Sharks. 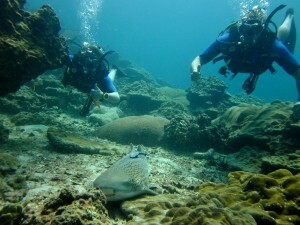 Although the visibility is less then Koh Ha (around 10 meter), it offers a larger amount of fish life. These dive sites offer plenty of shelter for currents and waves, give above water amazing views of Koh Phi Phi and you can find also around 8 different dive sites. Although these sites are frequently dived from many places, it is possible to find more quiet places with a bit of dive planning. Depth: between 0m. and 40m. These dive sites (except for Hin Bida and Karen Heng) are often dived by diving schools from Phuket, Krabi, Koh Phi Phi, Aonang and Koh Lanta. Therefore it pays off to plan the dives differently than anybody else. Because of the early start from Koh Lanta, Andaman Dive Adventure Lanta, tries to find more quiet area’s for diving. The sharks that live around these dive locations, are friendly, not man eating sharks and although leopard sharks some times pass by closely, we advise not to touch them. Furthermore there are also big schools of snappers in shallow area and stingrays on sandy bottoms. This is also the area where we mostly see leopard sharks. Black tip sharks on the other hand prefer more shallow water and are often seen by snorkelers as well.